Rene Pinto has reached base six times in the first two games of the series with Daytona. PORT CHARLOTTE, Fla. (August 28, 2018) - Ibandel Isabel homered twice to lead the Daytona Tortugas to a 5-3 win over the Charlotte Stone Crabs Tuesday night Charlotte Sports Park. 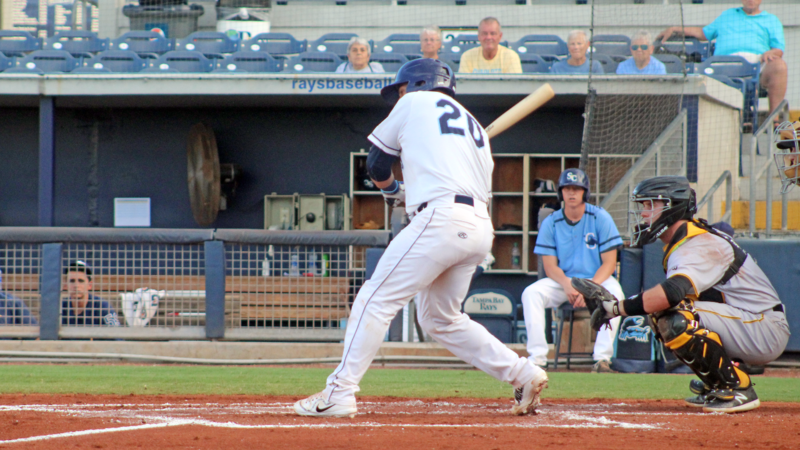 With Fort Myers' 2-1 win, the Stone Crabs' (71-59, 37-26) lead in the division shrunk to 0.5 games with six contests remaining. Isabel and the Tortugas (66-64, 29-35) jumped in front early against Stone Crabs starter Brian Shaffer (2-2). After Michael Beltre led off the game with a single, Isabel clocked a two-run home run to left to give Daytona a 2-0 lead. Still down by two in the bottom of the second, Jake Fraley walked before Rene Pinto doubled to left center to put runners at second and third with nobody out. Russ Olive followed with a sacrifice fly to center to plate Fraley and make it 2-1. Three batters later, Eleardo Cabrera dropped a two-out single to left to tie the game at two. With the game tied in the top of the fourth, Isabel cranked his second home run out to left to make it 3-2 Tortugas. Shaffer went five innings for Charlotte, allowing three runs on six hits while fanning three. In the top of the sixth, Daytona loaded the bases on a trio of walks. With two outs, Bruce Yari pulled a single through the hole on the right side, plating a pair of runs to make it 5-2 Tortugas. Stone Crabs reliever Zack Mozingo went three shutout innings, but the Stone Crabs were unable to get the big hit in the late innings. Charlotte will look to hold on to first place at 6:35 p.m. on Wednesday. Josh Fleming (3-2, 3.69) will make the start for the Stone Crabs, against Tejay Antone (5-3, 4.30) of Daytona. Coverage starts at 6:20 p.m. on the Stone Crabs Baseball Network.